Thanks to croiduire's bug report, this update corrects the error that was causing a hedge that is recoloured invisible to flash blue in neighbourhood view. For convenience, this release also includes the invisible rock recolour included in 100+ Tiny Filesize Transport Urn Recolours project. 1)	This update improves the routing of both teacher and student, making it more likely that they will position themselves correctly. 2)	The teacher and students now uses a more varied vocabulary, including Enthusiasms if FreeTime or any later EP is available. 1)	This update increases the probability that a student will sit at the same table as the teacher and reduces the likelihood of a student sitting in a position that faces away from him. If you downloaded this update on July 29th, please do so again. There was an error in the first upload. Learn to dance, and have fun doing so! Use this whimsical flamingo to invite an instructor to teach Dance, Body and Creativity Skills, increase Fitness, Culture Interest, FreeTime Music & Dance Enthusiasm and grade points, while satisfying comfort, fun and social needs. A full teaching session lasts about four hours and consists of lecture segments interleaved with dance practice. Students are instructed in modern dance ("Rave"), but if Bon voyage is installed, Hula and Slap dance lessons are also available by menu option. The lecture segments increase Creativity skill, and to a small degree the Dance skills as well. The dance segments increase Body, Dance and Fitness skills. If the teacher is an Island Local then no dress code is required, otherwise all those involved will wear Formal attire. The Flamingo will produce its own music to accompany the dance practice, but if the player wishes to use some other source then the Flamingo music may be switched off. In a Bon Voyage Tropical vacation neighbourhood, the Flamingo will default to playing Surf Music, with Hula lessons taught by a female Island Local. 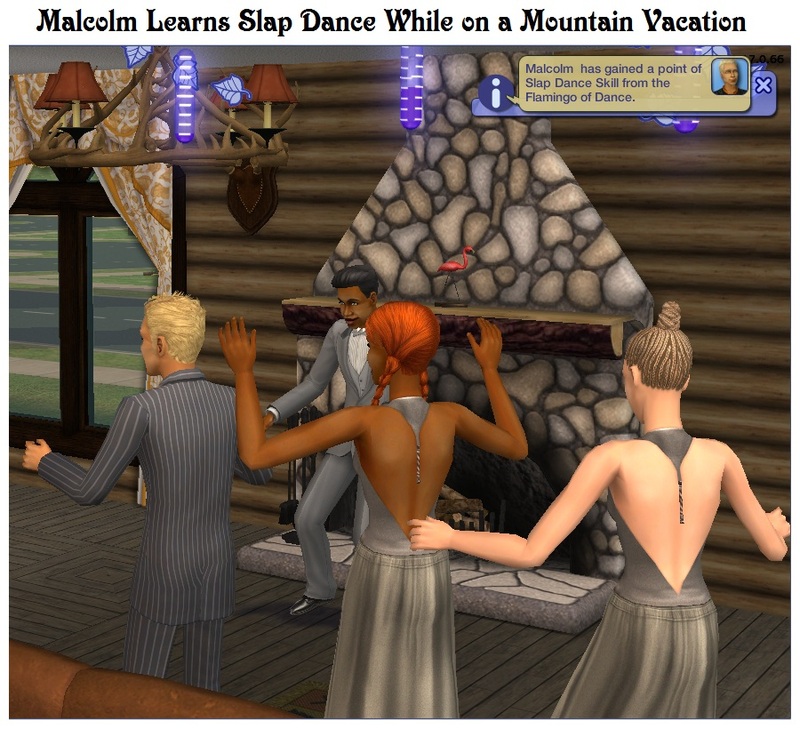 In a Mountain Lakes neighbourhood, the instructor will default to a male bartender or maid teaching Slap Dance using the World Music genre. In any other neighbourhood, the Flamingo defaults to Rave lessons accompanied by basegame Salsa - but if Bon Voyage is available, Hula or Slap lessons with Surf or World Music may be selected if desired. This cosmetic update to the Gnome's catalogue display now shows that this object improves Logic Skill as well as Charisma. This is one gnome that is not going to be stolen or kicked around - and it will summon a guardian to protect the lot from burglary. This charmed statue can also control leaves and puddles, and reduce vandalism. 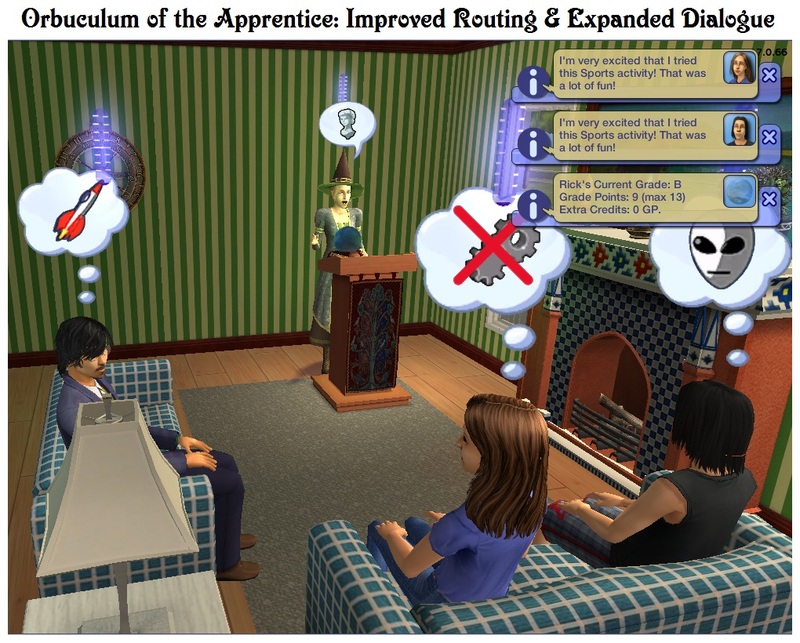 The guardian can teach Sims about the dark arts (i.e. criminal psychology), raising Logic skills, Crime interest, FreeTime Science enthusiasm and grade points, while satisfying fun and social needs. If the teacher is a magic user, such as the elder warlock who may be summoned by the Gnome, all in attendance will improve their neatness and comfort level, and students of the occult will increase their magic skill and shift to a neutral alignment. If Apartment Life is installed and magic is enabled, an elder townie will be transformed into a fully skilled neutral warlock who will dismiss the intruder magically - otherwise, the Gnome will call in a basegame police officer. 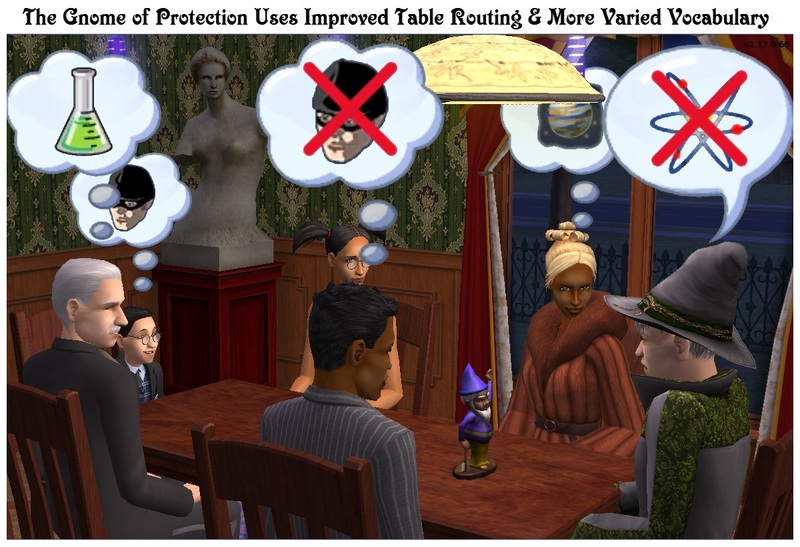 The warlock or magical guardian will optionally catch "Burglars Only" or several different "Undesirables" including the Basegame Burglar and Repo-Man; University Evil Mascot; Nightlife or Seasons Mrs. CrumpleBottom; and Bon Voyage Unsavory Charlatan. 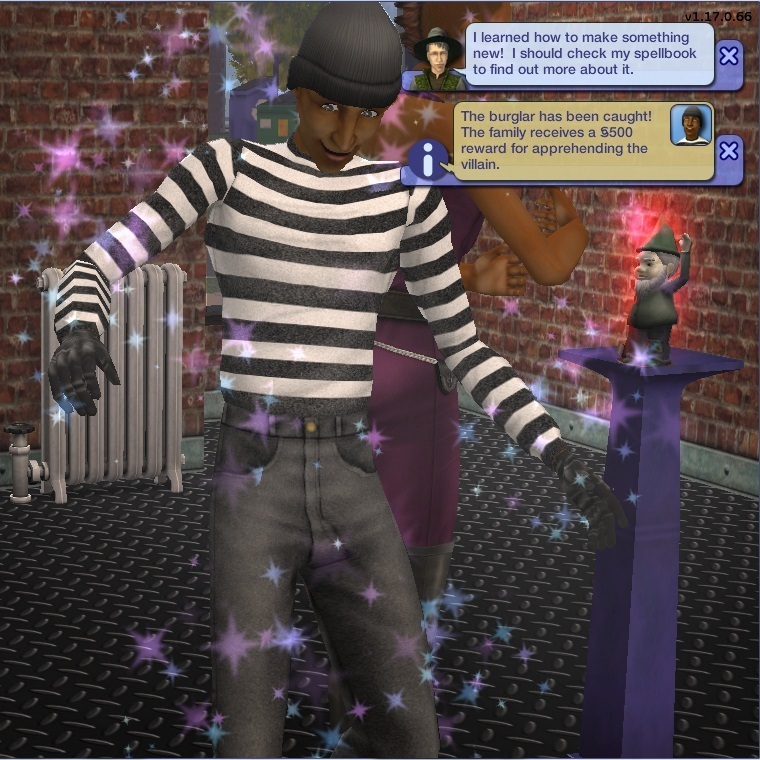 Only the burglar will win the current family a §500 reward when apprehended. When a burglar is detected, the gnome acquires a red glow. If the intruder is some other "Undesirable", then the gnome projects a blue glow. This effect lasts until the interloper is removed. In cases where the guardian response is delayed - particularly if he was socializing on the lot - failsafe code will automatically remove the intruder. This release changes the "Summon Fireflies" menu option to "Summon Butterflies" during the daytime (7:00 am to 6:59 pm). 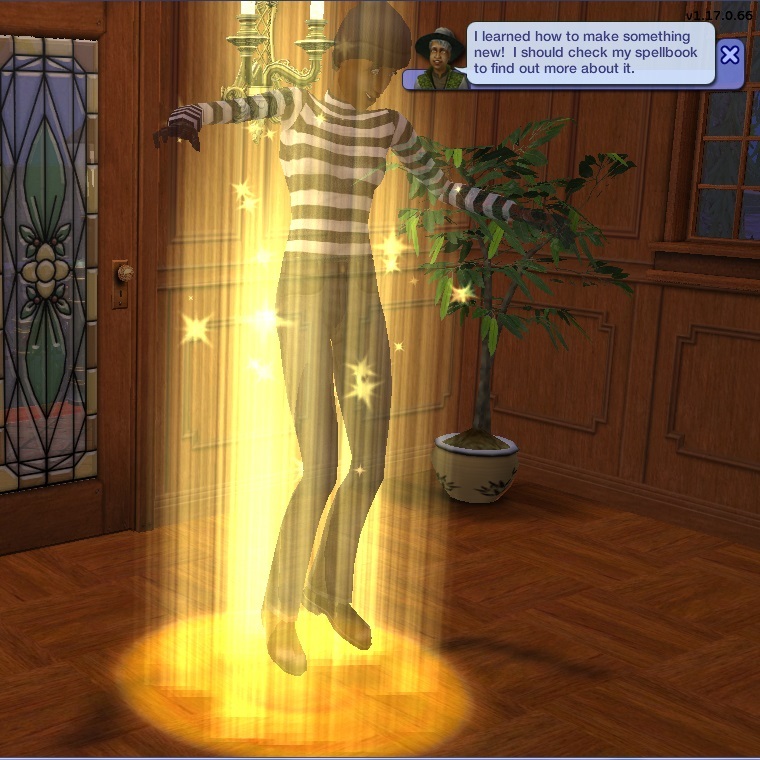 In addition, this menu option is now only displayed if Seasons (as well as Apartment Life) is installed. This blessed Lamp burns with an everlasting flame, unceasingly protecting the whole lot from the dangers of fire. 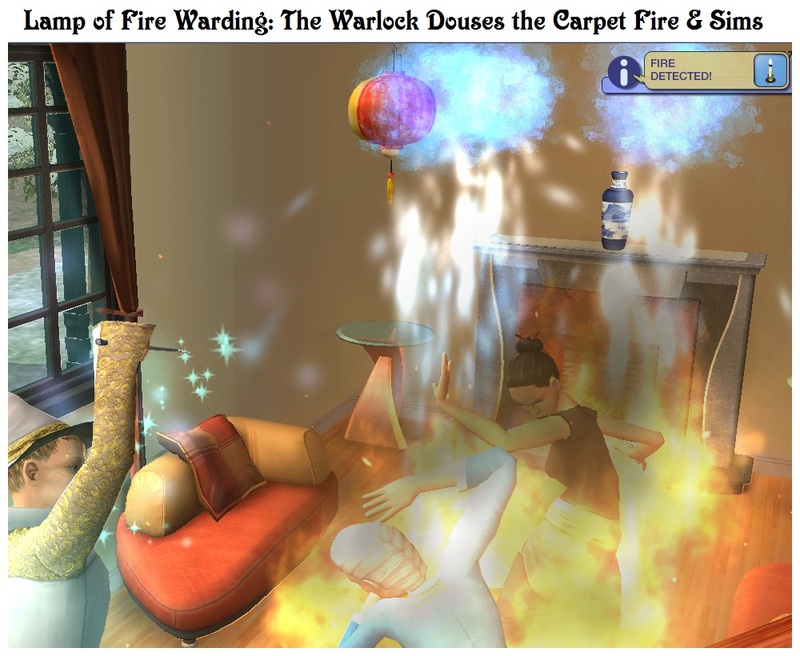 When fire breaks out and if Apartment Life is installed, a townie will be transformed into a good warlock who will extinguish the fire magically - otherwise, the lantern will call in a basegame firefighter. When fire is detected, the lamp's candle acquires a red glow that lasts until the fire is extinguished. If the warlock is not up to the task, backup code will automatically put out any fires that remain. While in the alarm condition, several menu items are suppressed. 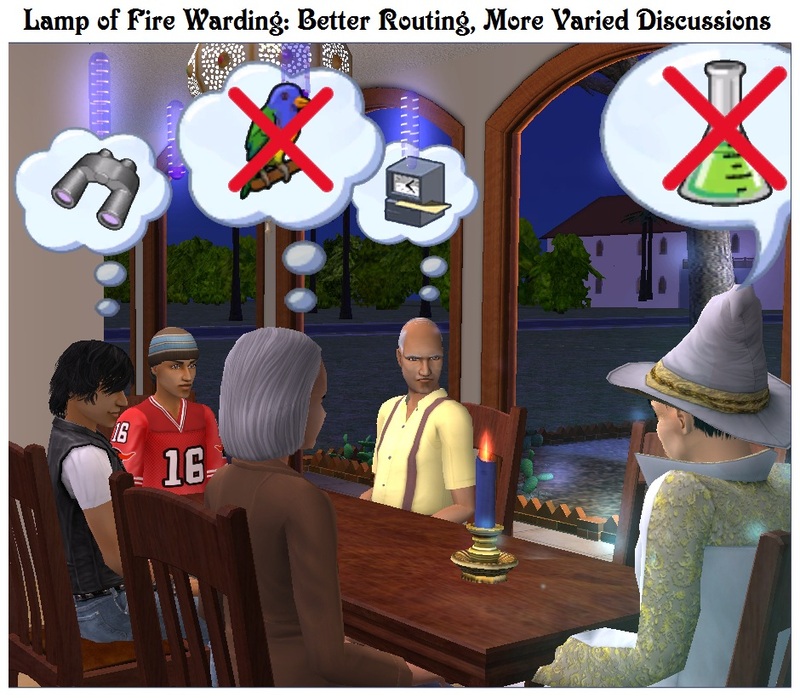 In normal conditions, the Lamp can create a good townie warlock to teach the Fire Prevention skill, raise Work interest and FreeTime Nature enthusiasm, increase grades points, magic skill and good alignment, and satisfy comfort, fun and social needs. If the teacher is a warlock, everyone present will become slightly Nicer, and the spellcaster can also bring happiness or summon fireflies to the lot. This typographical update removes a redundant "The" from the Activation and Deactivation confirmation messages.